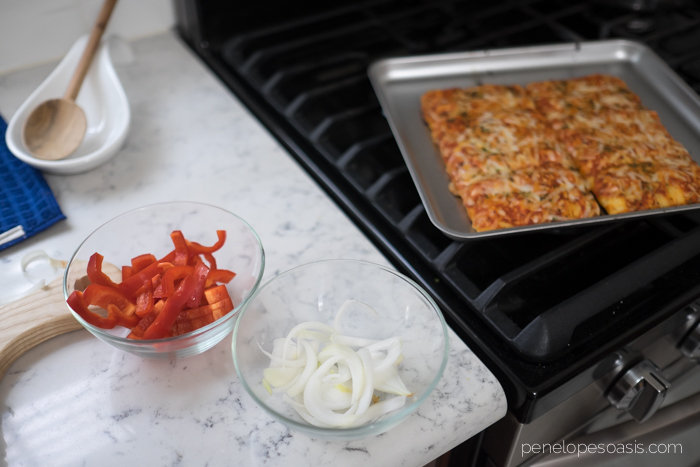 Planning A Fun Family Pizza Party! The best kind of family party is always a pizza party, because everyone loves pizza! And the best pizza for us is Ellio’s Pizza, the pizza I grew up with. So for our summer pizza parties this year we’ve been hosting “Create Your Own Pizza” parties. Ellio’s Pizza launched over five decades ago here on Long Island, NY and has been providing a consistently tasty, convenient, and value-priced snack with real ingredients ever since. Ellio’s is made with 100% real cheese and no artificial flavors, so you can feel good about serving it to your own family. 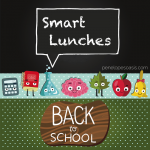 Ellio’s is a quick and easy meal solution whether you are coming home from a long day of errands and want to have dinner on the table quickly, or are hosting a family party and need to offer delicious food quickly serving after serving for hungry guests. 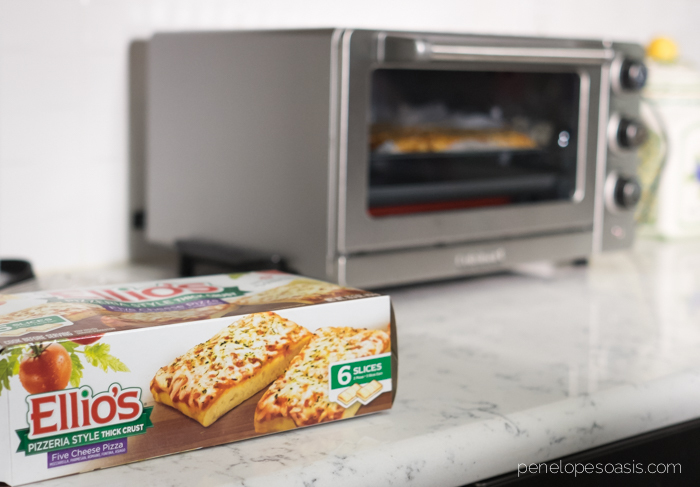 It can be made in the oven or toaster oven, and bakes to a crispy crust covered with zesty sauce and bubbly cheese in just 10-12 minutes – yum! 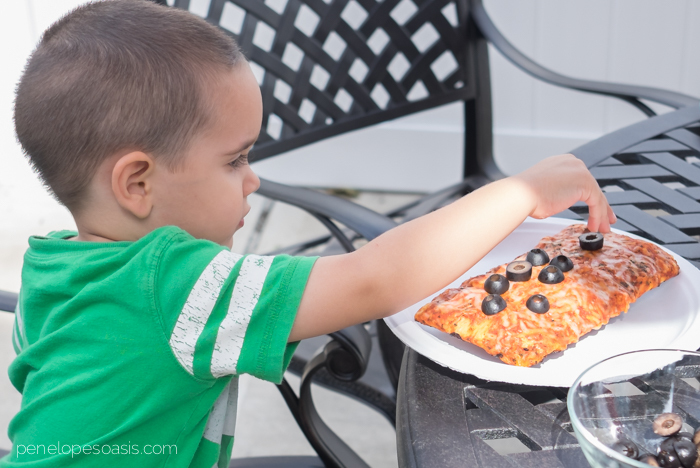 Because most kids love to help in the kitchen, and they sure do love pizza, an Add Your Own Toppings Pizza Party is a good idea for a family party with children. 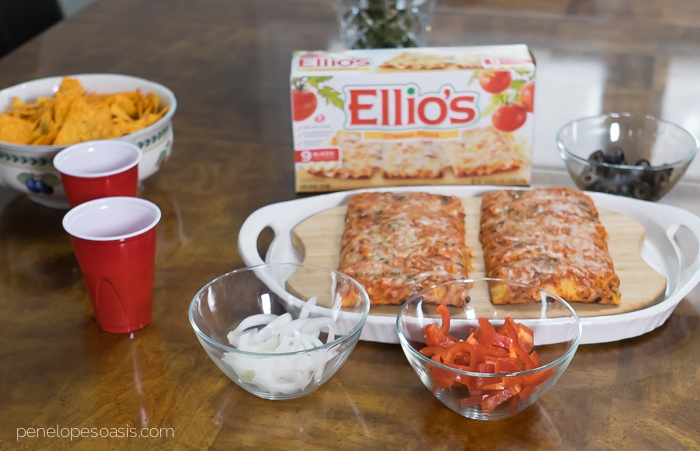 We baked up a variety of Ellio’s Pizza flavors and added our own veggie toppings, like bell peppers, olives and onions. 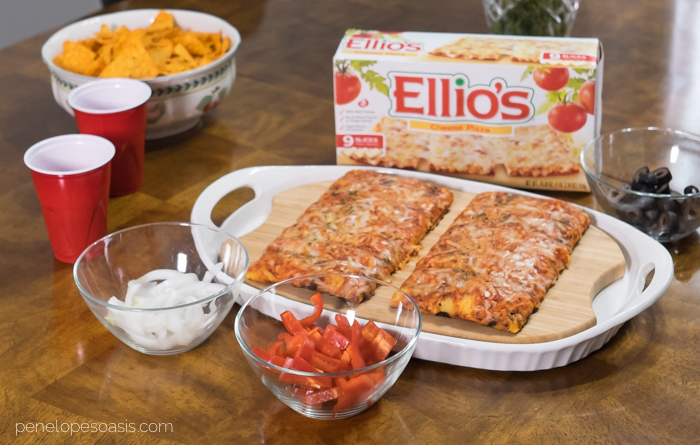 I grew up with Ellio’s Products, it was the pizza I ate Saturday nights with my family while we watched movies together, and now it’s the pizza my family eats Saturday nights while we watch movies. 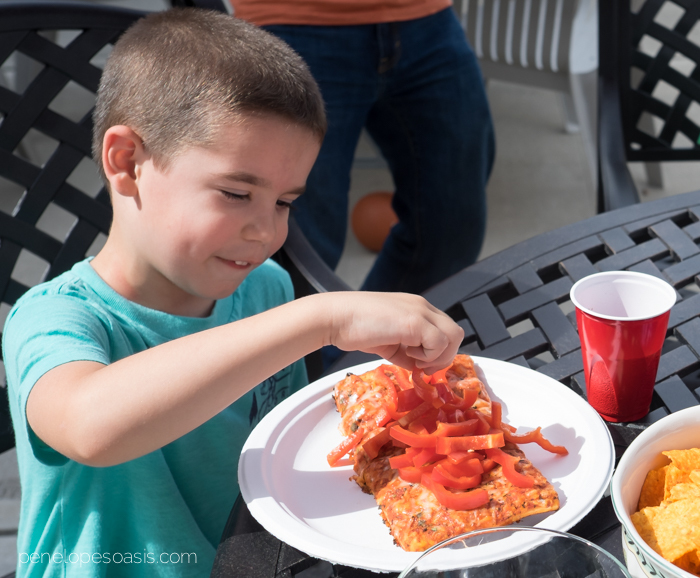 It’s also the pizza we serve at our family parties, as well as the pizza we serve as snacks for summer get togethers! Planning a family party? Be sure to remember Ellio’s pizza as the perfect choice for it. Check out Ellio’s Pizza on Facebook, Twitter and Tumblr for more info, and find them with the Ellio’s Pizza Store Locator. We love Ellio’s pizza. I have been eating it since I was a kid myself! My kids always liked building their own pizza. It was a fun and easy dinner. We love having pizza for dinner. Ellio’s looks really good. I’ll have to see if they carry it down here. Even if they don’t that still looks like a good pizza party. Those pizzas sound so good. I’d love to have the family try some pizzeria style pizzas for dinner. I’m not familiar with Ellios but I sure want some now! I love your video. I’m starving for pizza now! We love pizza but I hate the pain in the neck it is to make them from scratch. I think the Ellio’s pizza would be a great option. That’s such a fun idea! My kids would love adding their own toppings to their pizza. Can’t beat a pizza party I will have to get some. 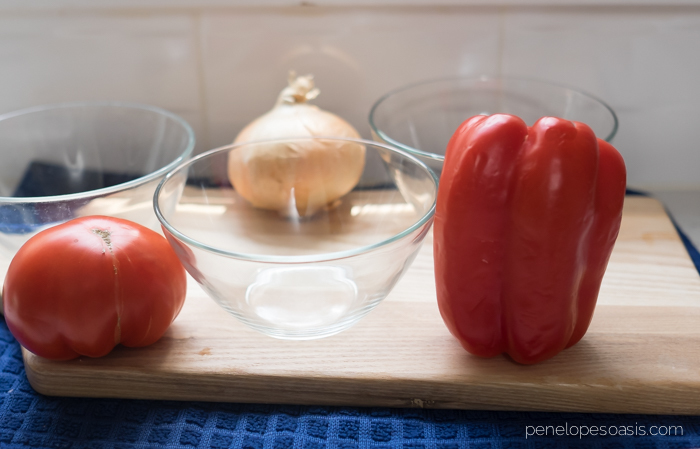 I just love the idea of adding extra toppings to bake at home pizzas. 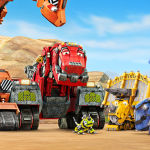 It let’s everyone create their perfect pieces and allows kids to feel extra important! This pizza looks yummy. It would make a perfect snack for my son and his friends. Pizza parties are always so much fun! I’ve never heard of Ellio’s before, but their pizza looks good! Looks liek a tasty and quick dinner option. We love pizza! My family loves pizza night! It’s one food the whole family can enjoy! What a fun idea! When my kids have a bunch of friends come over, it can be hard to accommodate everyone’s preferences. I would love to throw a DIY pizza party for home so they can all make their pizzas just the way they like. I think I have only ever met one person who didn’t like pizza… so everyone should like a pizza party!